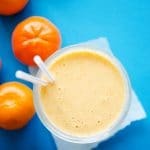 A quick and creamy Orange Dreamsicle Smoothie recipe to kick off your day with a boost of Vitamin C and happiness! Blend all ingredients well, adding more ice as necessary to reach a consistency of your liking. Recipe from Live Eat Learn at https://www.liveeatlearn.com/healthy-orange-dreamsicle-smoothie/.